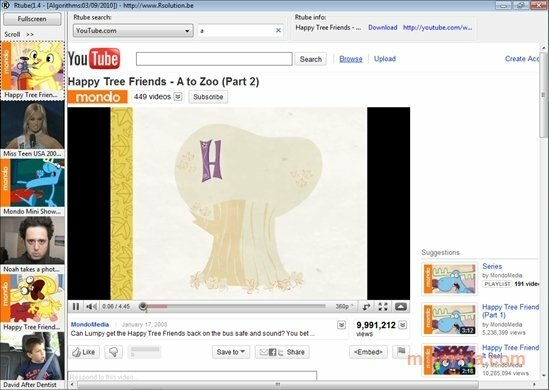 Rtube is a web browser specially designed to visit websites with online multimedia contents. Rtube grants you quick access to the videos embedded on webpages, so as to be able to view them quickly. Its structure is focused on searching for specific contents on specific websites and viewing their contents without having to access the web. This browser has a search engine by means of which you'll be able to view the contents that you are interested in. First we have to select one of the websites that the browser has predefined, among which we'll find YouTube, to name just one. When we perform the search, Rtube will show us on the left side all the videos that it has found on the website in question, by means of thumbnails. When we click on a certain thumbnail, the video will be loaded in the browser's main window. Furthermore, we'll have the option to watch it in fullscreen. 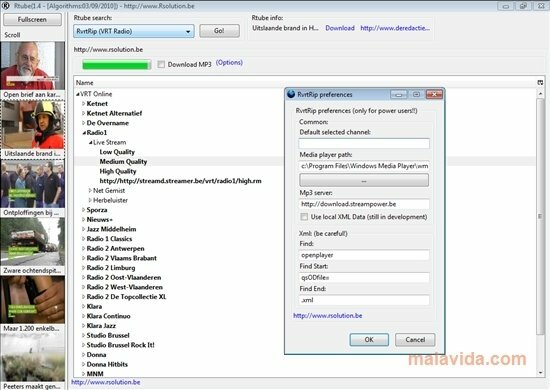 Rtube also allows us to download the videos in its premium version. Rtube will come in very handy if we usually visit websites like YouTube, because, as well as being able to watch the videos more comfortably, we'll also be able to perform searches. Certain features are only available for Premium users.